So all he has left is Dec. 23. All I can say about this is, the apple doesn't fall far from the tree. Case in point: When my friends Melanie and Shelly were grocery shopping for their annual Christmas party night before last, they got to the front of the store and were ready to check out. At the last second, Shelly looked in the cart and said, "Wait. I don't think we have enough chocolate for Kat." So they turned that cart around and went back for more. GOD BLESS 'EM. I knew you liked chocolate, but I had not idea you liked it THAT much. Must go to the store before New Year's Eve. All sane people love chocolate! Are you a semi-sweet or, milk or dark chocolate? I start with my favorite... the dark...the move down the line. Ahaha now there's a kid after my own heart. 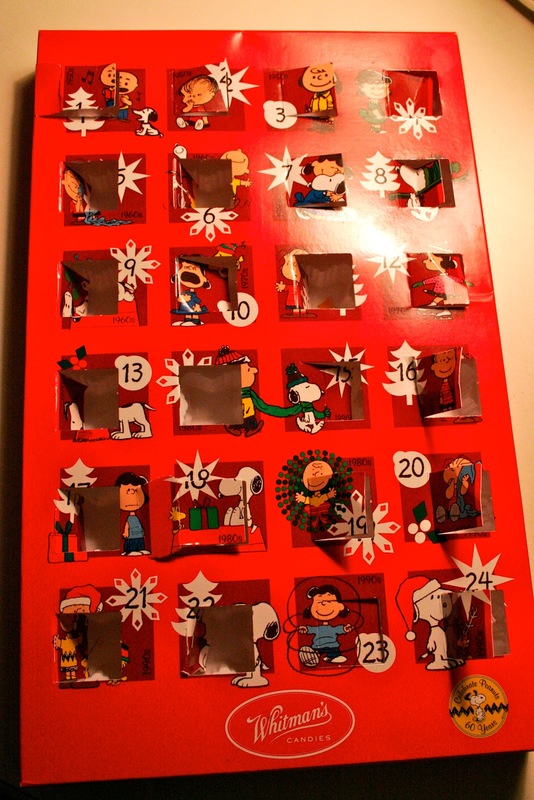 That is totally something I would have done a child, and probably would still do now, if I had an advent calendar! Paige, my love for the chocolate is well-documented and all-consuming. I do love it THAT much. Beckie, I totally agree! I'm a milk-chocolate candy bar girl, but I love dark chocolate in small doses.